Jacobethan is a mode of Tudor Revival architecture comprising a blend of Jacobean and Elizabethan architecture. YOU'RE PULLIN' MY CHAIN! THE NEW BOG STANDARD Turn these Victorian toilets into a high-end jeweller's? Here you can pick up a river boat to cruise up past grand houses and yacht marinas to the quirky market town of Totnes, with its strange combination of alternative therapies and Elizabethan architecture. You have a fantastic example of Elizabethan architecture, a stately home and all the treasures within, which obviously are fascinating. Elizabethan architecture deserves special affection because it was invented in England - concocted from French, rather than Italian, neo-classicism, and with wonderful brickwork and fantastical decoration from Flanders. In addition, visit Longleat House, one of the best examples of high Elizabethan architecture in Britain, and one of the most beautiful stately homes open to the public. 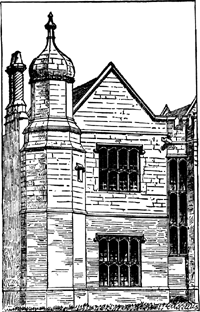 In 1885, local land-owner Lord Mostyn offered them the lease of his neglected Elizabethan mansion Plas Mawr in Conwy, then partly occupied by a junior school, which they restored making it one of the outstanding examples of Elizabethan architecture in the UK. The house, an elegant example of Elizabethan architecture, belonged to Katherine Rogers, mother of John Harvard, whose bequest founded Harvard University. It is widely regarded as one of the best examples of high Elizabethan architecture in Britain and one of the most beautiful stately homes open to the public. It is not just because of its majestic Elizabethan architecture with its pink sandstone bricks, mullioned and double transomed windows, not to mention its battalions of tall chimneys. It is a perfect example of Elizabethan architecture. The following day found us at Longleat - widely regarded as one of the most beautiful stately homes open to the public and the best example of Elizabethan architecture in Britain. Harlaston's winding village street has several Elizabethan buildings while others of note include The Manor House, a timber framed building originally constructed around 1540, The Homestead, and Haselour Hall, a good example of Elizabethan architecture, with its five-gabled frontage and interior containing some rare linen-fold panelling with every panel showing a different design.